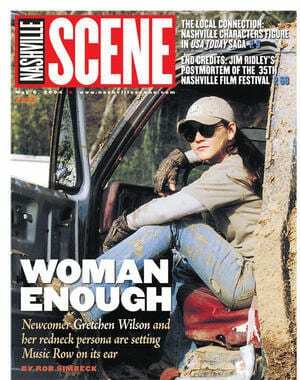 [Nashville Scene] Just over a year ago, Gretchen Wilson looked into the abyss. Her third album, One of the Boys, had tanked, its singles stalling at 32, 35, and 53 in Billboard. The label team that had guided her 2004 debut CD Here for the Party to quintuple platinum sales had largely been swept away in the wake of a corporate merger. She had asked in mid-2008 to be released from her Columbia Records contract, but Joe Galante, chairman of parent company Sony Music Nashville, had declined, saying he wanted to launch one more album. Singles from that project had also gone nowhere and its release was in limbo. Even when things went right they went wrong. After the label placed her “Work Hard, Play Harder,” in a promotional spot for Saving Grace, the Black Crowes sued, alleging she and co-writers John Rich and Vicky McGehee had ripped off the verse melody from their “Jealous Again.” And Wilson’s sprawling 300-acre Lebanon, Tenn., estate and the 30 people who made up her band, crew and staff, once symbols of just how far she’d come, were rapidly draining her resources. The pain and uncertainty would last for six more months.